Our brightest suspenders yet! Lights are super bright & prominent with a classy stripe down the middle. Will remain bright for several hours with a new battery. One size fits most, fully adjustable suspender length sizing with an elastic slider on the piece that connects to the back of your pants. LED Light controllers takes four replacable CR2032 batteries and has 4 settings: Full On, Slow Blink, Fast Blink, Off. Battery packs are integrated into the strap in the back area of the suspenders. 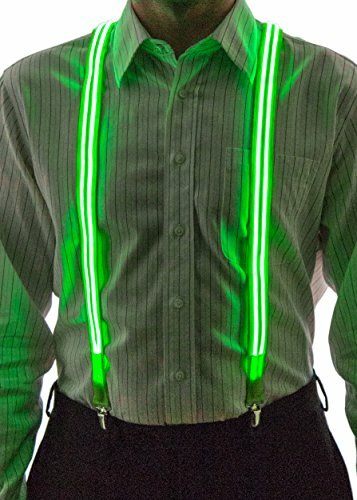 Rock this glowing set of suspenders at a club, bar, party, concert, or rave. It’s the perfect ice breaker for singles. Regardless of where you are you’ll be getting tons of attention from others who are curious about your beautiful neon accessory. Use the fast flicker mode when you want to get a busy bar tenders attention and you’ll find that you have your drink before everyone else. Trouble flagging down that late night taxi? You’ll be noticed with these suspenders. The Neon Nightlife team has performed tons of research & product development to offer the brightest glowing products in the industry. Our bright technology really makes a big difference when you’re at locations that are not completely pitch black dark. The light up material is all throughout the suspenders illuminated meaning when wearing the product, your chest and back will both be illuminated. Each set of suspenders includes 2 small battery packs that each have a button that controls 4 modes (off, constant on, slow blink, fast blink). Each battery pack uses two CR2032 replaceable batteries (included) and lasts several hours of continuous use. The batteries can be replaced by sliding the battery pack out from the fabric and removing the battery pack’s screws using a small phillips screw driver. We offer a 90 day warranty on the product. If for any reason the suspenders break under normal usage, we will replace it within 90 days. Adjustable neck length fits most people. Easy to adjust length. Easy to use. Requires 2 AA batteries(not included), then it works when press the switch. Three modes: constant light, slow flashing light and fast flashing light.